Homemade meatballs are amazing and much easier to make than most people think. I make a huge batch of these then freeze them. They can be used for spaghetti and meatballs, meatball sandwiches, swedish meatballs or as a topping for pizza. 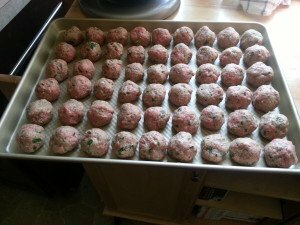 I make my meatballs on the smaller size so they are more versatile. Start by preheating your oven to 350 degrees. Take two to three pieces of bread (I use bread ends I have stored in the freezer) and toast them in the toaster on a light setting. You can also use stale italian bread for this if you have some in the house. You do not need to toast the stale italian bread if that is what you are using. Tear up the bread and put it into a food processor. 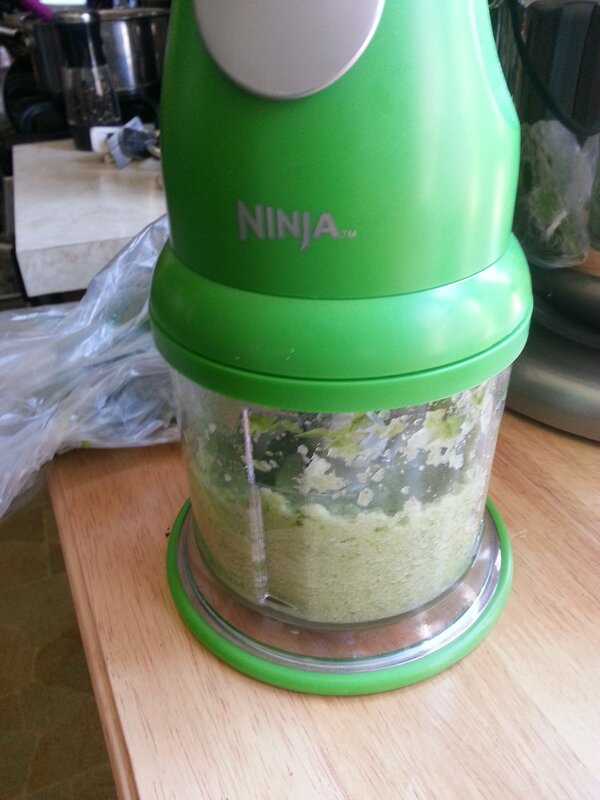 For this task, I love my Ninja Express Chop . I use it throughout this recipe. It’s small, does an amazing job and is wicked easy to clean. 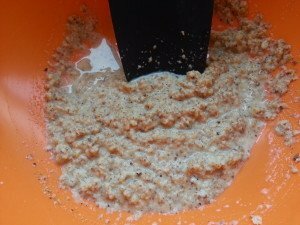 Pulse the bread until you have evenly chopped breadcrumbs. You should have about 3/4 of a cup of crumbs. 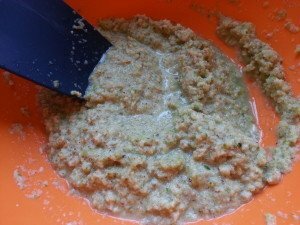 If you don’t have any bread, you can use unseasoned bread crumbs but they meatballs are so much better with the homemade crumbs. Combine the bread crumbs with 1/2 cup of milk in a large bowl. I know this looks kind of weird, but trust me it adds amazing flavor and moisture to the meatballs. I also use this same method when I made meatloaf. In the chopper , add one medium onion, quartered and half of a green pepper, which has been cleaned and seeded. Process this until you have a paste. See how small the pieces are? This helps to add moisture and ensures no ones gets a huge piece of onion or pepper. Add this to the bread mixture and combine. 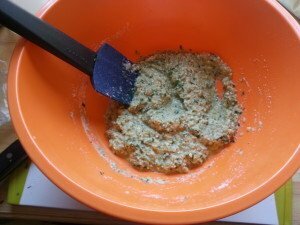 Add one egg, one teaspoon each of garlic powder, salt and pepper, 1/4 cup chopped fresh parsley and 1/2 cup grated parmesan cheese to the bowl and mix everything together well. You’ll notice that the mixture is a bit drier now. Add 2 and a half pounds of ground beef. 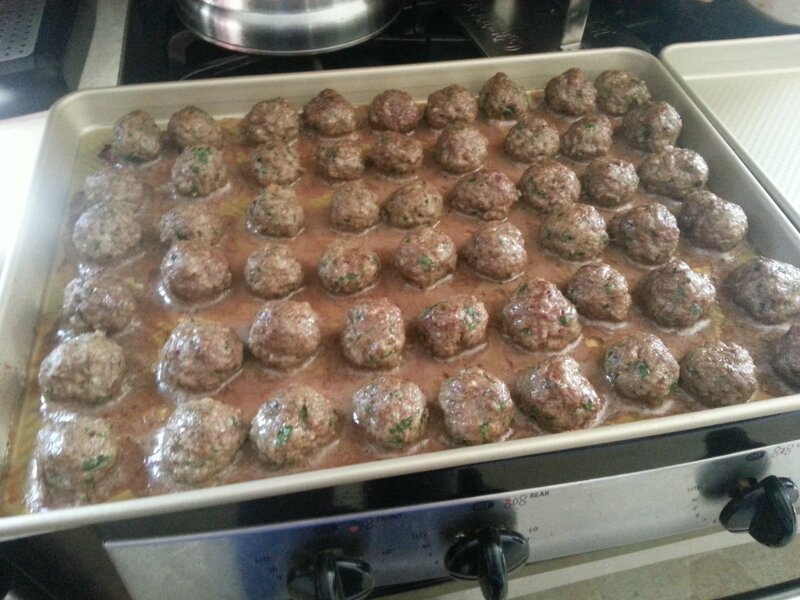 Yes, that is a lot of beef but this is a huge batch of meatballs. Remember, you are going to freeze them so you have lots of yummy dinners in your future. 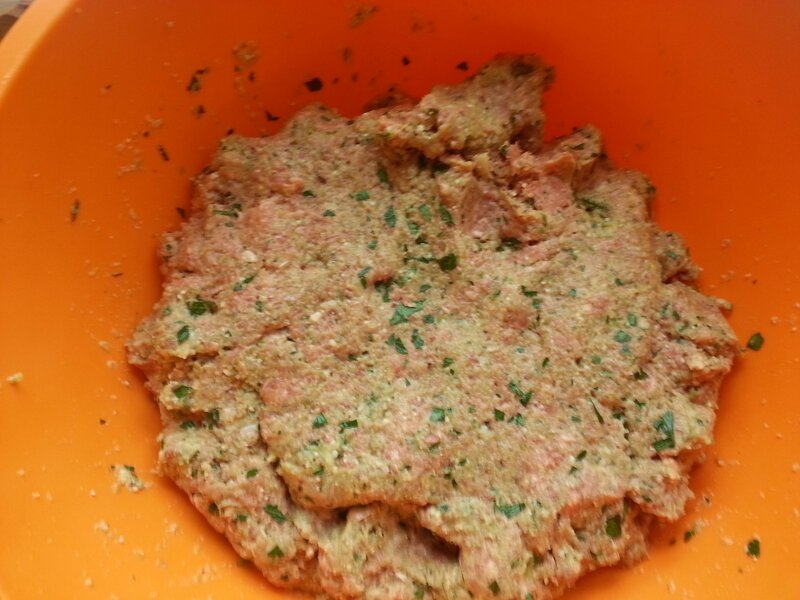 Take a bit of the meat and lightly roll into a ball. Don’t mess with it too much. You want them to stay light. These meatballs are about 1 to 1.5 inches in diameter. I think I made the one I’m holding a little bit smaller after taking the picture. Roll them all up. This should be enough to fill an entire sheet pan. Try to make them approximately the same size. Bake for 30 minutes in a 350 degree oven. If you plan to use some of them that day, you can drop them into whatever sauce you are making. Use tongs so you do not get all the extra fat into your recipe. 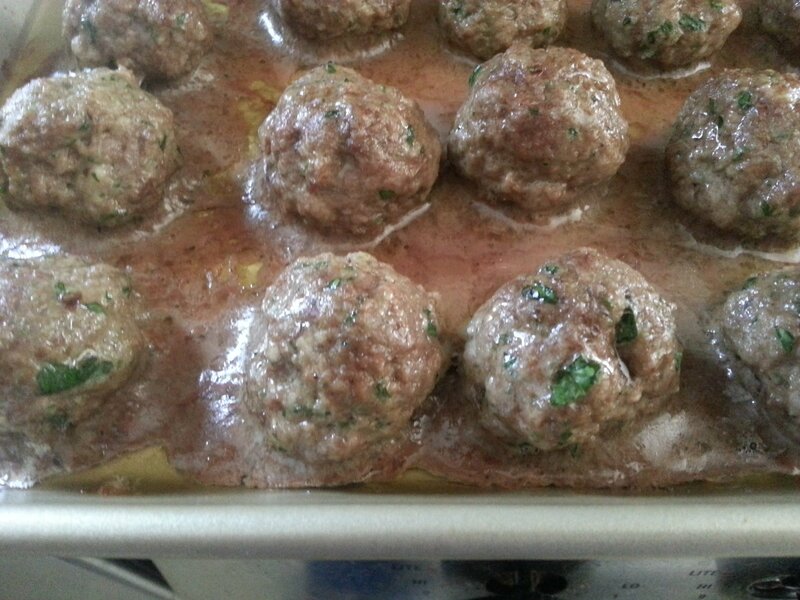 If you plan to freeze them, use tongs to place the meatballs on a clean sheet pan and freeze them for at least an hour. I froze them overnight. Once they are all frozen, put them in a ziplock bag or freezer safe container. Then you can pull out as many or as few as you need. By freezing them on the clean sheet pan, they will not stick together in the freezer bag or container, which makes them much easier to use. 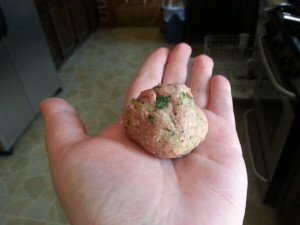 Last night, I made spaghetti and meatballs, with these meatballs that have been in the freezer for about a month. This was a last minute decision because my original dinner plans went out the window. I placed some of the meatballs on a microwave safe plate and microwaved on high for one minute. Then I added the meatballs to a sauce pan with a jar of spaghetti sauce and cooked some pasta. Dinner was on the table in 30 minutes. Combine bread crumbs and milk in a large bowl. 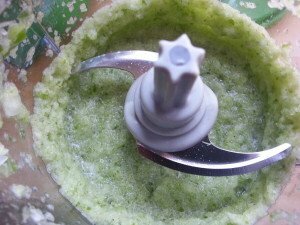 Process onion and green pepper in a chopper or food processor until reduced to a paste. Add the onion and pepper to the bread mixture. Add egg, garlic, salt, pepper, parsley and cheese to the bowl and combine well. Add beef and mix with hands until combined. Roll mixture into 1 to 1/5 inch balls. Bake at 350 degrees for 30 minutes. Use immediately by adding to sauce with tongs (do not add drippings). 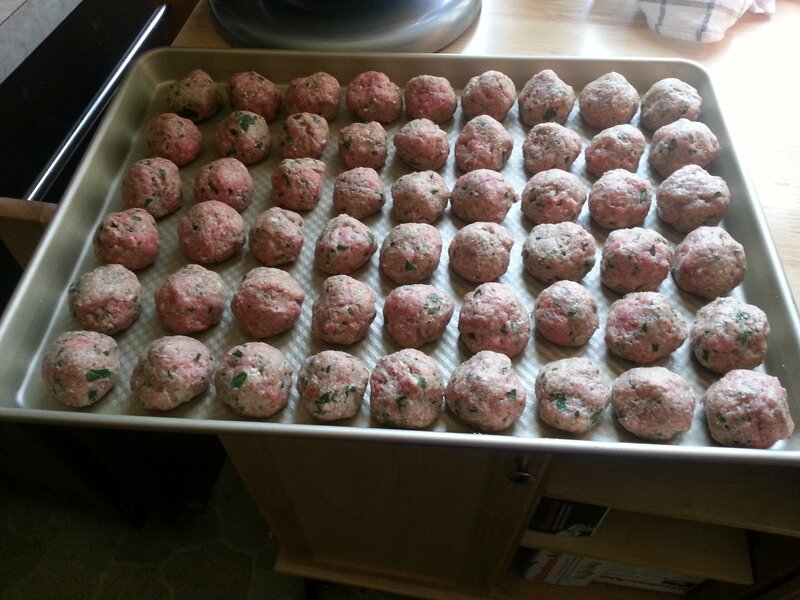 Freeze meatballs by placing on a clean baking sheet and freezing for at least one hour. Store in a plastic bag or freezer safe container.